There are a bunch of winter activities I want to try and at the top of the list, both because of its accessibility where I live and the perceived fun factor, is snow biking. When I lived in Alaska, I'd see folks using what looked to be mountain bikes with giant fat tires on them just to get around when the snow got deep in Anchorage. Now, the sport is gaining recreational popularity as the rest of us discover it's a great way to enjoy an activity normally reserved for warmer weather. To learn more about the ins and outs of snow biking, I sent a note to a friend that knows a thing or two about it. Brett Simpson, photographer and former director of Bloomsburg University Quest, picked up the sport to be sure he kept training for a big ride he had coming up when the weather turned cold. The phrase "big ride" doesn't quite describe the Tour Divide, arguably one of the hardest bike races in the world. Racers travel over 2,400 miles from Canada to Mexico's Adventure Cycling Association's Great Divide Mountain Bike Route. 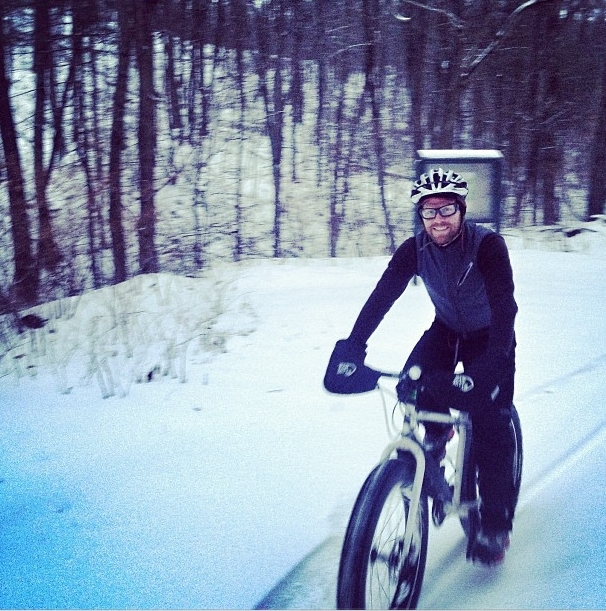 For Brett, training through the northern Pennsylvania winter is a must. Brett started out riding his 29er mountain bike or his road bike in snow, then made the decision to transition to a sport-specific snow bike. Snow bikes are a relatively new concept, and the main difference between a snow bike and a standard mountain bike or road bike is the width of the tires. Snow bike tires can be up to 4.5 inches wide and require very low pressure (10 psi compared to the 90-100 psi I have in my road bike tires). The snow bike frame is designed to accommodate the larger tires. Brett picked up a Surly Pugsley, one of the first mass-produced complete fat bikes, from Freeze Thaw Cycles in State College, Pennsylvania this year. Now, lighter fat bikes in aluminim, titanium and carbon fiber are available, but Brett prefers the steel frame and thinks the Pugsley was the perfect starter bike for him. 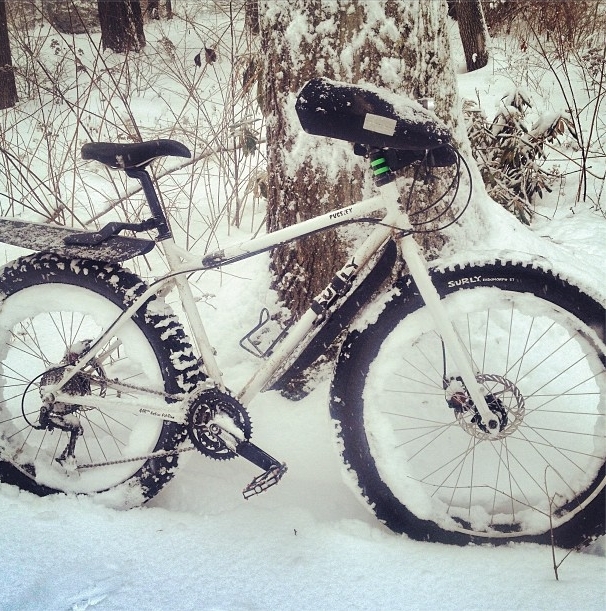 For Brett, the transition from a mountain bike to a snow bike took time. "I started with way too much tire pressure. It’s hard psychologically to realize your tires can be great with less than ten psi. I run as low as five in snow. I also switched my front and rear tires and that made a big traction difference. After riding a lot this winter, and even attending one race, I finally have my tire pressure and setup pretty dialed in." And it's not just about the right bike, it's about finding the right conditions. "While they are snow bikes," Brett says, "there is a limit to how much fresh snow they can handle." Ideally, you'll want a groomed trail, or a trail that's been packed down by snowmobiles, snowshoes, or other snow bikes. Then, there are all of the snow bike-specific gear and clothing considerations. Brett started off using clipless pedals, which he was used to using for mountain and road biking, then added shoe covers for warmth. But he found his cleats were always packed full of snow and made the switch to platform pedals with a winter boot. "It had been a long time since I ran flats but it has been great for my bike handling. If I was doing more long distance riding on snowmobile trails where I didn’t clip out, or was racing more, then I’d likely be clipped in." Brett says. He doesn't always stay on the trail when he's snow biking, and having the freedom to release his feet from the pedals easily is ideal. When it comes to layering, the same cold weather principles apply. 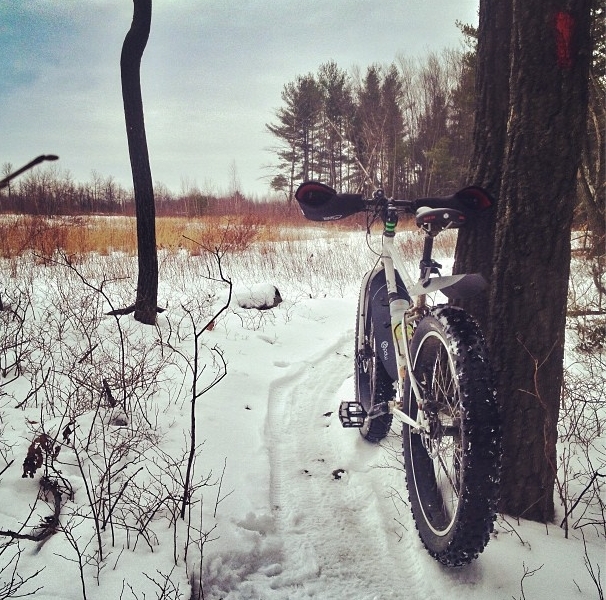 Snow biking is aerobic and you'll get warm quickly; starting out a bit chilly is a good guideline. You don't want to sweat in the cold; wet clothes put you at risk for hypothermia. For Brett, the right gloves and boots are key. "I don’t like big bulky mitts," he says, and found a hand layering system similar to what he uses for whitewater kayaking. 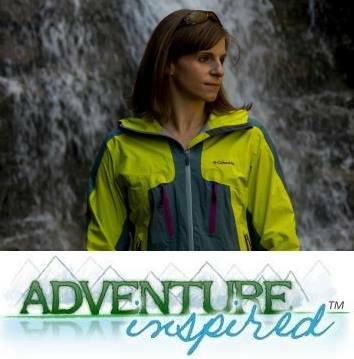 "I always loved pogies (neoprene mitts that attach to the paddle) and found the equivalent for kayaking from Bar Mitts. I have two sets now, one for road bike style handlebars and one for mountain bike handlebars." Brett also carries a frame bag on his snow bike as well as a special pump to be sure he can add the right amount of air to his specialized tires. I'm hoping to dust off my mountain bike, let some air out of the tires, and get to snow biking when we actually get some snow around here! Huge thanks to Brett for providing so much information. Follow his training progress, and eventually, his Tour Divide race on Facebook. agreed! have you tried it? if we'd only get some snow around here, I'd go out right now! If we ever get any snow again, I definitely will!